Our 18-week Signature Training Program offers programming for walkers to beginning runners to experienced runners. We offer classes with cardiovascular interval training for all levels concluding with strength training, stretching and education. Our Learn to Run program will help you safely build up to your first 5k race. Walkers and experienced runners, will be encouraged to follow an interval training schedule designed to maximize your fitness levels. We also offer weekly steady paced cardio classes designed to help build endurance and offer an option to increasing mileage. We have marathon and half marathon training plans that integrate with our program to provide the support and accountability you need to reach your goals. Walker or runner, you will start at your own level and progress throughout the season. All options include 18 weeks of classes, and a technical tee or tank! ​`Click any registration button below to see additional payment options, including pay in advance to save. Our registration fee includes a free tank or t-shirt, but for a limited time get an extra tank, tee, or long sleeve pullover for a discounted price! Save 30% on tanks and tees with a promo code good during registration only; purchase in our online store and items ship free to your franchise location to be distributed during the first week of classes. Exact styles are subject to change. Colors may not appear accurate on your screen. Coach Stacy is the head coach with Moms on the Run Bloomington. 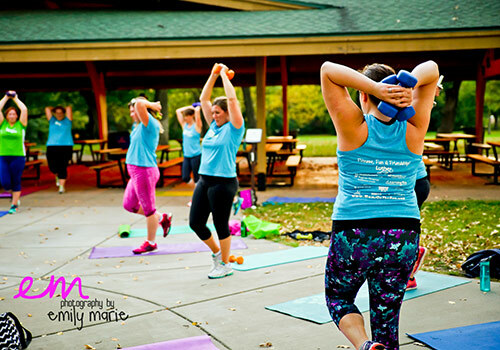 She also coached at the Moms on the Run Minneapolis location for several years. She was the kid in school who dreaded running a mile but developed a love for running in college and discovered the running community is made up of all ages, shapes and sizes. She loves running 10 mile and half marathon distances and to date, has run 7 full marathons. She enjoys staying active with her husband and kids and their many pets! She understands how challenging it can be to fit fitness into your life when you work full time and have a family, so she enjoys getting creative and running while her kids bike or doing obstacle courses at the park for some strength training. She loves working with Moms on the Run and truly enjoys helping other women find a way to fit fitness into their busy lives, connect with other women, and have fun in the process. Change up your regular running routine and take your fitness indoors! We offer strength training as well as indoor track workouts. You'll raise your heart rate and get incredible results. We also have options to layer up and keep up your endurance with outdoor weekend runs.